The ME-33 from Olympus is a boundary microphone that when combined with a professional voice recorder provides the ideal solution for recording meetings, conference calls and more, even in large rooms with many attendees. The microphone is purpose-built to clearly record voice at a distance. It is usually positioned near or flush with a boundary (surface) such as a wall or tabletop. Such an arrangement prevents phase interference between direct and reflected sound and outputs a natural sound. Additionally, the microphone automatically cuts extremely high- and low-frequency sounds, improving audio quality. 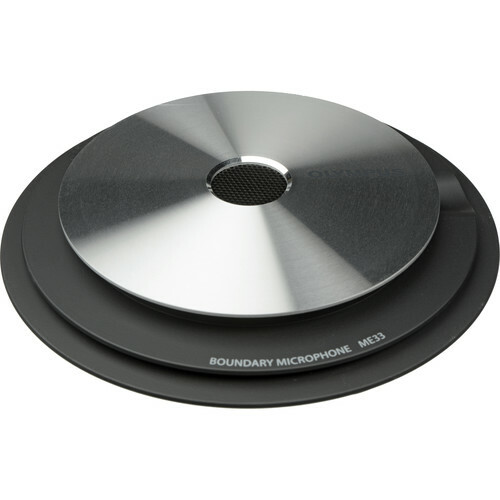 ME-33 Boundary Microphone is rated 5.0 out of 5 by 1. Rated 5 out of 5 by Brooks from Great for groups I used this for a focus group, paired with an Olympus recorder. It worked fantastic for a small group in a conference room, placed in the center of the table. I can even tell the location of the speaker on the playback. What is the power source for Olympus ME33? The Olympus ME33 requires plug in power of 1.5 to 5v which is received through the audio cable when connected to an Olympus voice recorder, or similar device such as a camera or laptop that is able to supply this power. I want to know how much radius will be covered by single mic ?